There were so many images swirling around my head as i first listened to this I really had a hard time beginning this review. I knew once I got started I would be fine but the first words were tough. I went hunting for a digital image of the cover to place in this review while trying not to read anything that was written about it before but in this case I stumbled across a little of the back story of why this record came to fruition. It all started in a small Texas town called Marfa, an artist hideaway about an hour away from the Mexican border. (I read most of 2666 in Mexico.) 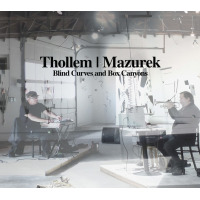 It was here that Rob Mazurek had a residency which ultimately led to a showing of his art, an exhibition that was called foreshadowingly enough, Rob Mazurek: Marfa Loops Shouts and Hollers, as the three tracks on the record are Shouts, Hollers, and Howls. So instead of writing this review, I became absorbed in the newly revealed visual art dimension of this musician that I have followed and admired for years. Some of his work can be seen in the background of the album art. Also worth looking up his work to give you a better idea of what the title, Blind Curves and Box Canyons, means. This recording was created to commemorate and celebrate the culmination of his residency. Along with Thollem McDonas, (modified electric piano and analog effects) they create the perfect backdrop to walk around a gallery and study all things painterly but also a stand alone piece of music that will resonate with fans of Mazurek’s Exploding Star Orchestra’s work but on a more personal level. The record starts with Shouts, and with comes bells, a twisted manipulated musical statement until Mazurek (cornet, voice, bells, modular synth, and sampler) gives a guttural shout, (a reoccurring element of the album) and there is a slight pause as Mazurek’s horn blast through letting you know that it’s not all about the artwork. Let’s also not think it’s all about Mazurek either. Thollem has not only a great ear to keep up with some of the chants and yells, he also has an understanding of the goal at hand here, often times it jumping into the rabbit hole and the rest of the time it’s climbing out of it. Hollers is a very melodic interlude of sorts as electric piano and cornet tangle themselves around each other until sample after sample join the soup. One of the greatest wins in this 21 minute track is the sonic shifting between ideas, instruments and samples. With Thollem hammering the keys and Mazurek’s voice rattling around the bandwidth, it produces a new joy every 15 seconds or so. The album closes out with a great sounding electric piano with plenty of stops and pauses almost taunting other instruments to join the epilogue. Mission accomplished as a cacophony of drums and rattles and synthesized noises completely drowns it out. Howls, in turn become a fitting 6 and a half minute closer when Thollem plays a repetitive descending line until the track fades off into the West Texas night.